Harnecker is the author of many books and pamphlets on movements to build “21st century socialism”, drawing on her first-hand engagement in such experiments throughout Latin America. In this interview, as always, her emphasis is on forms and methods of popular organisation, including the development of “a new militancy in which the way we live and work politically prefigures the new society”, while pointing to the need for anti-capitalist forces to “develop an alternative project”. Marta Harnecker will be a featured speaker at the sessions of the Society for Socialist Studies, meeting in Ottawa June 2-5, 2015 (http://socialiststudies.ca/congress/2015-ottawa/). 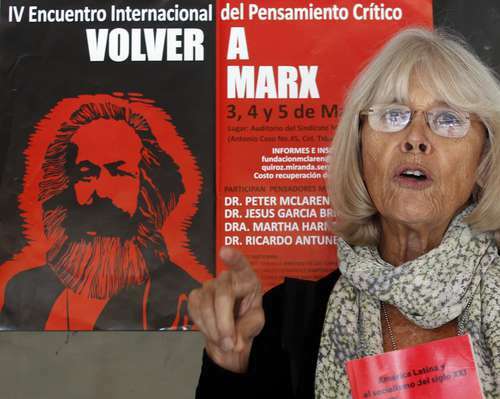 This interview was conducted in Buenos Aires by Isabel Rauber, a prominent Argentine Marxist, and aired on Rauber’s radio program on September 16, 2013. The transcript, from which I have translated the major part, was published by Rauber on her blog, Código Rauber. The footnotes are mine. What do you think would be the fundamental message for the present tasks facing the popular governments on the continent in relation to their peoples and to power? You know, Isabel, I think Allende’s socialist project was the precursor of the 21st century socialism of which President Chávez was the great promoter. Not only was Allende the first socialist president in the world to be elected democratically, he was the first to try advancing toward socialism by the institutional road and the first to understand that to do this he had to take his distance from the Soviet model. That socialism could not be imposed from above, it had to rely on the support of a large majority of the population, and it had to be a part of the national traditions, a socialism with red wine and empanadas as he designated it, that is, a democratic socialist society rooted in the national-popular traditions. When Allende — aware that the Chilean electorate was divided very roughly in thirds: the conservatives, the Christian democrats and the left, with a slight preponderance of the left — posed the need to count on the support of the Christian democrats, with which majority support could be achieved for the project, our left reacted in a very sectarian fashion by confronting the members of that party; it never understood the need to ally with forces that were designated as bourgeois. When Allende spoke of winning sectors of the bourgeoisie to his project, a major part of the left reaffirmed that our enemy was the bourgeoisie as a whole. While Allende wanted to consolidate the advances being made on the economic plane — state ownership of the major strategic enterprises, making very clear the limits of the power that he was relying on — sectors of the left seized small businesses and called for their nationalization, demanding that Allende be more radical. When Allende was fighting to achieve a united leadership of the process, the strongest parties (the Socialists and the Communists) publicized their differences. One of the great limitations that the Allende government had was the institutional framework it inherited. Although the President and the Popular Unity clearly needed to elaborate a new constitution in order to change the institutional rules and facilitate the peaceful transition to socialism — and in fact President Allende presented the parties making up the Popular Unity with a proposal for a new constitution in September 1972 — he never issued a call to carry out this project. I think it is important to study it because it embodied Allende’s ideas on how the social transition should be made based on the Chilean reality. So why, then, did he never issue that call? Because he thought the Popular Unity still lacked the majority electoral support that was indispensable if a successful constituent process was to be carried out. The UP never managed to achieve 50% or more of the votes. The big question that history cannot answer is what would have happened if that so-called political coalition had decided to exert its forces and go house-by-house working to win the population to its project. Perhaps we lacked audacity, the audacity that President Chávez had when the opposition called for a referendum to overthrow him and he agreed to enter the fight even though at that point the polls put him far behind. He agreed to weigh in at a time when he was at a disadvantage, but he immediately planned how to achieve the forces to win in this contest and he created the idea of the patrols, that is, groups of 10 persons who could involve people who were not members of parties but who sympathized with Chávez; each of them was to win the support of another 10 by going house to house. Another lesson that I think is fundamental in the Chilean process is the importance of the popular organization at the base. One of our greatest weaknesses was not to understand this, to delegate political action to the politicians, or rather, the fact that the politicians appropriated politics and, with that, the Popular Unity committees — which were basic to Allende’s electoral victory — began to weaken and to disappear. What in your view are the challenges and the principal tasks for the popular movements and the Latin American left? I think our left and our popular movements must be very aware of what occurred in the Chilean experience, so we don’t repeat the same errors. We have to understand that in order to build an alternative society to capitalism that is essentially democratic we have to be able to win the hearts and minds of the majority of the people. The present crisis of capitalism means that larger and larger sectors are feeling affected. Already there exist not only objective conditions but also subjective conditions for more and more people to understand that capitalism is not the solution to their day-to-day problems. We need to develop an alternative project, and in this the experiences of the governments and popular movements in the more advanced countries in our region can be especially valuable. What is required is a new militancy in which the way we live and work politically prefigures the new society. Activists who embody in their daily activity the values that they say they defend. They must be democratic, supportive, willing to cooperate with others, to practice comradeship, complete honesty, sobriety. They have to project vitality and a cheerful approach to life. While we fight for the social liberation of women, we have to begin now to transform the relations between men and women within the family. Our members must be able to learn from the new social actors of the 21st century. They are particularly sensitive to the theme of democracy. Their struggles have generally had the fight against oppression and discrimination as their point of departure. Hence they reject attempts to manipulate them and they demand respect for their autonomy and to be allowed to participate democratically in decision-making. I think our members must also be disciplined. I know this is not a very sympathetic subject for many people. I like to quote one of the national coordinators of the MST, the Rural Landless Workers Movement, Joao Pedro Stédile, who says: “If we don’t have a minimum of discipline, which means that people respect the decisions of the various authorities, we will not build an organization. Discipline consists in accepting the rules of the game. We have learned this even in football and in the Catholic Church, which is one of the oldest organizations in the world…. If someone is in the organization by his own free will, he has to help build the rules and respect them, he has to be disciplined, he has to respect the collective. If not, the organization does not grow. But that does not mean that our cadres must have an order and command mentality. They must be popular educators, respectful of the creative initiative of the people. On the other hand, a new political culture is needed, a pluralist and tolerant culture that prioritizes what unites us ahead of what divides us, that promotes unity around such values as solidarity, humanism, respect for differences, defense of nature, rejecting the profit motive and market laws as the guiding principles of human activity. We need a left that begins to realize that radicalism is not in advancing more radical slogans or carrying out more radical actions — which only a few follow because they frighten the majority — but in being able to create spaces for encounter and struggle for broad layers, because finding that we are many when we are in the same struggle is what makes us strong, what radicalizes us. A left that understands the need to win hegemony, that is, the need to convince, not to impose. A left that understands what is more important than what we have done in the past is what we do together in the future in order to conquer our sovereignty and build a society that allows the full development of human beings, the socialist society of the 21st century. Lastly, I want to tell you that while capitalism is in crisis, it will not disappear all by itself. If our peoples do not unite, organize and struggle intelligently, creatively and courageously, capitalism will find a way to repair itself. Our peoples have said ENOUGH and begun to walk, they must not stop now, the struggle is long but the future is ours! For more articles, videos, and pamphlets by Marta Harnecker also consult: http://tinyurl.com/l5wt896. Meaning by the parliamentary and electoral method. For a similar conclusion by another observer of the Chilean process, see this article by the late and lamented Roger Burbach, The Other September 11: The Legacy of Chilean Socialism and Salvador Allende. – RF.